Will green improvements boost your home’s value? Experts weigh in on the buying and selling of real estate with energy-efficient upgrades. Shopping for a single-family home, Elahna Paul and her husband, Hal LaCroix, compiled a pretty typical wish list: high ceilings, hardwood floors, good closet space, and a big backyard. Four years into their search, they toured a 110-year-old Victorian in Somerville’s Spring Hill section and liked what they saw. Not only did the home check many of the items on their list, it also had all new dual-pane windows. “That was a plus,” says Paul. “It meant the energy costs would be lower.” The couple bought the house in August 2011. Paul and LaCroix are environmentally conscious, but they would be the first to tell you their energy-efficient windows didn’t close the deal. They paid for the whole package, not one feature. Same when they installed solar panels in 2014 — they wondered what the panels would do to their home’s value but took the plunge without being able to settle that question. And that makes the pair pretty typical for the Greater Boston housing market. 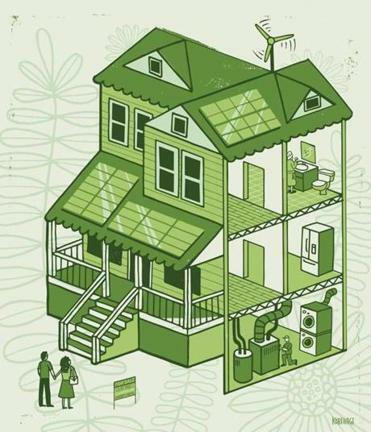 “Buying and selling green homes is in its infancy around here,” says Somerville-based agent Thalia Tringo, “but we’re moving to a more educated public.” Similarly, real estate agents, sellers, and appraisers are learning more about the wide variety of green-home features now available, trying to determine how they can affect a property’s value. Since green renovations don’t translate into dollars and cents as easily as traditional renovations, it can be tough to calculate the value they add — or perhaps subtract — when it comes time to sell. Foley believes those figures speak to buyers’ general desire for lower home operating costs. And that desire, he noted, increased after last winter’s frigid temperatures left many owners with sky-high energy bills. Still, when greening up your home, it’s hard to know where to put money down. Homeowners and buyers face the same challenges. Better windows, more efficient HVAC systems, and air-tight exteriors don’t scream selling point the same way granite countertops and finished basements do. And then there’s the fact that not a lot of so-called greened-up properties have exchanged hands yet in this area. When prospective SunBug customers ask, “What is this going to do for my home value?” Mayer’s answer usually boils down to “It’s complicated.” The available data do suggest that a solar system increases home values at a rate of about $3 per installed watt. So with a typical 6,000-watt system that costs around $25,000 before incentives, a customer could expect an $18,000 appreciation in home value. A few years ago, economists from the University of California Berkeley and UCLA examined 1.6 million home sales in the Golden State from 2007 to 2012 to see whether green labels — Energy Star, LEED, GreenPoint — increased sale prices. Controlling for key variables, they found green-labeled single-family homes sold for an average of 9 percent more than non-labeled homes. Another study of roughly 66,000 home sales in the San Antonio area showed that properties listed as “energy efficient” — meaning they included features such as high-efficiency HVAC systems and dual-pane windows — enjoyed a 5.8 percent higher price over comparable properties lacking those features. For houses on the Multiple Listing Service advertised with a specific “green” feature, such as low-flow toilets, there was a 1.7 percent price bump. In some ways, these studies suggest that most buyers are interested in specific ways to save money, rather than making the largest purchase of their lives based on principle. That means the green real estate market is still a lot like the one for hybrid and electric cars: Although lots of Prius and Volt buyers are looking to do their part to save the planet (especially those who happen to live in Cambridge), surveys show even more of them just want to save a few bucks at the gas pump. Smart sellers can find a way to capitalize on that. The advice from the experts is to keep the sales pitch simple and straightforward. Buyers may be more familiar with the lexicon of energy efficiency now, but it’s still easy to bury valuable information in a flood of talk about R-values, thermal bridging, and low VOC finishes. Electricity bills that quantify savings can make all the difference. “People will pay somewhat more for energy efficiency that can be documented for them,” says Thalia Tringo, the Somerville agent. But for the vast majority of buyers, location and design still drive sales, MacArthur adds. “I’ve yet to see anyone who’s saying, ‘I’m changing my parameters because I want this green house.’ ” And that makes it hard to put a price tag on comfort and other green-home perks. a home that you really liked in a lot of ways, but somebody had put an ugly solar system on the roof, put panels in dumb places, you might go ‘I wish they hadn’t done that,’ ” he says. The problems can be especially pronounced for homeowners who rent solar arrays, rather than buy them outright. 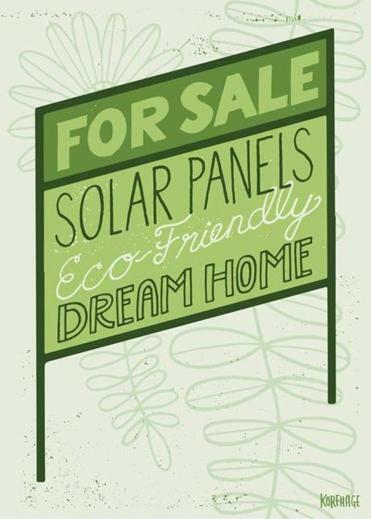 In a residential power purchase agreement, homeowners allow a system to be placed on their roof — the company decides the type of panels and the layout — and then buy the electricity that the panels produce. Since homeowners renting solar arrays often sign a long-term contract, ranging from six to 25 years, they could find themselves looking to sell while they have years left on their contract. Experts say lots of home buyers might be wary of getting saddled with that kind of commitment. Hoen, Craig Foley, and Sandra Adomatis all say they plan more studies on the cost versus value of solar panels and other green features. Like buyers and homeowners, they want more specifics. But they also believe greened-up homes will become much more of a must-have in the future. Shira Springer is a Globe staff writer. E-mail her at shira.springer@globe.com and follow her on Twitter @shiraspringer.